*Ocean Two Resort and Residences* is located on the south coast of Barbados, on the pristine Dover Beach. Accommodations are one- and two-bedroom units. Guests can enjoy many on-site amenities, including a beachfront restaurant, a swim-up pool bar, a meandering pool, a full-size gym, and a secluded rooftop patio complete with drink service and plunge pool, creating a romantic location to watch the sunset. The resort is within walking distance of restaurants, shopping, and sporting facilities. 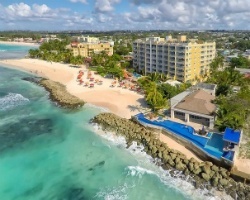 To discover more, please visit www.oceantwobarbados.com. Beautiful resort with many onsite amenities! Week 46! RTU until 2037! Buyer may receive a title fee credit, inquire for details!